Monday - Friday 8 - 5. Key Drop Box for Before/After hours delivery.Shuttle service w/Appt. 858-679-8000 ''Oldest Shop in Town''. Website coupons! Free check outs and quotes! 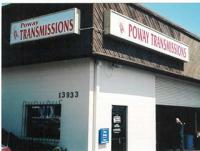 Service your transmission every 15-20k miles. Don't Flush! Call us! Glad to answer your questions, call us anytime. Check light on? We check it for free! We explain each step of the way. Friendly helpful service! AAA Award winning shop. A+ Accredited with the BBB. Strong community partner. Let us help you today! On the East end of Poway Rd - past the Car Dealerships. Look for a 2 story building & a 20 ft tall red & white sign. Driveway is right in front of our front door. Between Midland & Garden Rds.